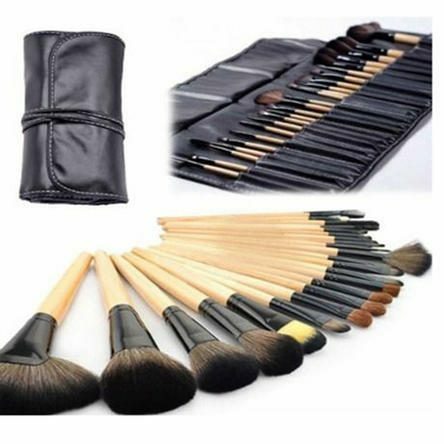 Two Elephants 24-Piece Set: Professional Makeup Brush Kit with Roll-Up Carrying Case Just $17.99! Down From $59.99! You are here: Home / Great Deals / Two Elephants 24-Piece Set: Professional Makeup Brush Kit with Roll-Up Carrying Case Just $17.99! Down From $59.99! Sears has this Two Elephants 24-Piece Set: Professional Makeup Brush Kit with Roll-Up Carrying Case on sale for $17.99 (Reg. $59.99)! Of course, if you’re going to create a masterpiece, it helps to have a great canvas. More importantly, you need to have the right tools. This fabulous Professional Makeup Brush Kit has all the tools you need to create the perfect look for any occasion. Whether you’re going for a natural, soft daytime look or a dramatic evening style, you’ll get it perfect, thanks to these professional-grade brushes. This set is great for at-home use, but it’s also extremely portable–simply roll up the case and hit the road. Grab this beauty essential today and get started on creating some memorable looks.